Does your business experience productivity slow downs when email fails? Do you have a large investment in IT infrastructure? Do you struggle to stay up to date with office software? 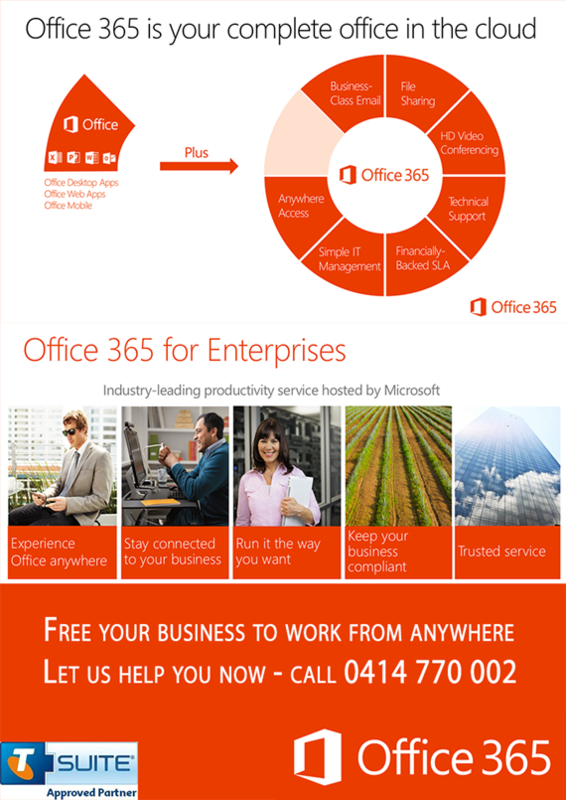 Microsoft Office 365 is the world’s leading cloud software provider for small medium and large businesses. Why? simply put, nearly every business uses Microsoft Office to create and view documents, spreadsheets and presentations, has email, and needs to share their files with customers, suppliers and staff. Microsoft Office has been delivering that solution on the desktop since 1995 – now almost 20 years later Office 2013 Professional Plus is available as a free add on to the Office 365 Cloud Subscription service. Heres what you get (specific offerings will depend on the actual price point) out of the box. We have been helping our customers migrate from their desktop and on premises email and document management solutions to full cloud based document management systems for several years now. We operate int he cloud – you can too. Experience the productivity gains, expense savings (its cheaper!) for yourself. We can even set you up with a 90 day demo.